Looking for a way to embrace the season, but not quite ready for heavier fall fare? This Roasted-Squash and Kale Salad strikes the perfect balance. It’s colorful and substantial, without feeling like too much too soon. Looking for a way to embrace the season, but not quite ready for heavier fall fare? 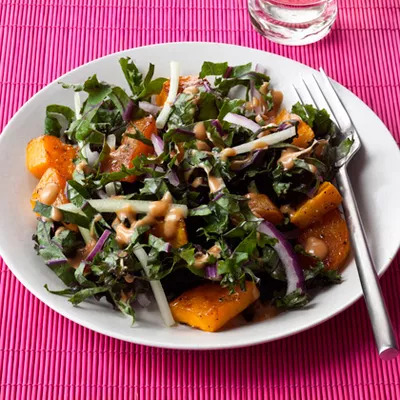 This Roasted Squash and Kale Salad strikes the perfect balance. It’s colorful and substantial, without feeling like too much, too soon. If the thought of another mixed salad has you yawning, the peanut-based dressing should pique your interest. Made with peanut butter, ginger, soy sauce, and lime, it’s both filling (thanks to the protein in the peanut butter) and surprisingly sweet. Still not sold? This salad is also chock full of nutrients. The kale and butternut squash combo guarantees that you’ll hit your daily superfood quotient in one fell swoop. Just one serving more than satisfies daily vitamin A, C, and K requirements while providing an impressive 8 grams of fiber.